Another expansion to Cities: Skylines - a popular city builder strategy game developed by Colossal Order. As the title might suggest, this add-on allows a player to create environment-friendly cities. Apart from over two hundred new buildings (e.g. This is Cities: Skylines expansion pack. Cities: Skylines – Green Cities for PC is a yet another expansion to Cities: Skylines – a popular city builder strategy game developed by Colossal Order. The expansion for PC requires the base game in order to work. As the title might suggest, this add-on allows a player to create environment-friendly cities. For this expansion, developers have prepared a wide selection of new attractions, the most prominent one being the set of over two hundred new buildings. The DLC described herein introduces e.g. shops selling healthy food, photovoltaic cells on the buildings' roofs, as well as electric cars driving on the streets. Also important are the new specializations for particular districts – they can be developed as one progresses through the game. All this is well complemented with four new types of regulations. Moreover, a player can erect a monument to honor their services to the environment. Even though in Cities: Skylines – Green Cities for PC one can erect entirely new and eco-friendly cities, there is nothing standing on his way to utilize the new solutions for the infrastructures he has already built. 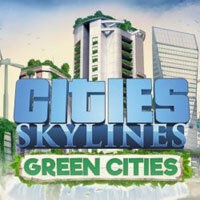 The PC release of Cities: Skylines – Green Cities does not implement many changes into the game's audiovisuals.